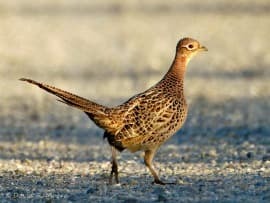 In The Pheasant by Raymond Carver we have the theme of paralysis, connection, struggle, conflict, identity, change and control. Taken from his Fires collection the story is narrated in the third person by an unnamed narrator and after reading the story the reader realises that Carver may be exploring the theme of paralysis. There is a sense that both characters in the story are stuck or paralysed by their circumstances. Gerald gets very little work as an actor and when he is not working spends his time at Shirley’s home. Nothing changes for him. Similarly Shirley appears to believe that she is in a relationship that is going nowhere and as a result decides upon ending her relationship with Gerald. Though it is not explicitly stated by Carver there is a possibility that Shirley considers Gerald to be incompatible with her. They both may wish for different things. Though what that might be for either character is never fully explored by Carver. The setting of the story may also be important as Carver could be using the setting of the car and the confined space that both characters are in as symbolism for the paralysis that exists in both characters’ lives. Just as Shirley is stuck in the car with Gerald she might also feel stuck in their relationship though again she might be fully aware that the relationship is going nowhere hence her inclination to split up with Gerald. There is also a sense that Gerald is trying to make a connection. He begins to ask Shirley exploratory questions none of which Shirley really answers. If anything it is possible that Gerald rather than attempting to connect with Shirley is attempting to connect with himself, to find himself. It is as though there is an internal struggle or conflict within Gerald. He doesn’t appear to know who he is which may play on the theme of identity. Shirley on the other hand is more comfortable and relaxed with herself she knows who she is though she does have the advantage of being twelve years older than Gerald. It may also be important that both characters are looking for a change in their lives. Gerald by trying to figure out who he is and Shirley by wanting to end her relationship with Gerald. If anything both characters are unhappy with their lives though for different reasons. The fact that there is very little communication throughout the story between Shirley and Gerald may also be important. Many relationships falter or end due to a couple’s inability to talk to one another. As the reader has very little insight into the relationship we are left to assume that things are not necessarily as they should be. Despite a possible animosity between both characters no effort is made in resolving what may have been the trigger for Shirley to decide upon ending the relationship. A relationship which came to an end prior to Gerald deliberately killing the pheasant. The fact that Shirley is also the more relaxed of the two characters may also be important. By being more relaxed it is possible that Carver is suggesting that Shirley accepts the position she finds herself in. She intends to move on from Gerald while Gerald himself still seems to be lost and uncertain of what he will do with his life. If anything it is Gerald who is reliant on Shirley. Shirley has the means to remain independent while Gerald doesn’t. The end of the story is also interesting as Shirley takes control for the first time. Where previously Gerald had been leading the way (symbolically by driving) Shirley demands the car keys from Gerald. She is also adamant about how she feels about Gerald and does not hold back when she gets the keys. If anything Shirley puts herself in control of her circumstances. She is not reliant on Gerald in anyway. Though both characters are going their separate ways there is a sense that it will be Gerald who will suffer more than Shirley will. Gerald is on a path of self-discovery while Shirley will most likely find another man who will be more compatible with her outlook on life. What is also interesting about the end of the story is the fact that Carver introduces the opinion of both the waitress and the trucker. The waitress is fully behind Shirley and what she has done while the trucker believes that Gerald should have put Shirley in her place. Both opinions are relevant to the story as they are both based on who has control. The waitress believes that Shirley is in control while the trucker believes that Gerald should take control of the situation away from Shirley. Though the trucker’s method of resolving the situation involves Gerald being physically violent towards Shirley. It may also be important that at no stage in the story is the reader fully aware as to why Shirley wishes to end her relationship with Gerald. All we are given is a brief snapshot with no background to formulate a real opinion on what might be wrong in Shirley and Gerald’s relationship. McManus, Dermot. "The Pheasant by Raymond Carver." The Sitting Bee. The Sitting Bee, 7 Dec. 2016. Web.